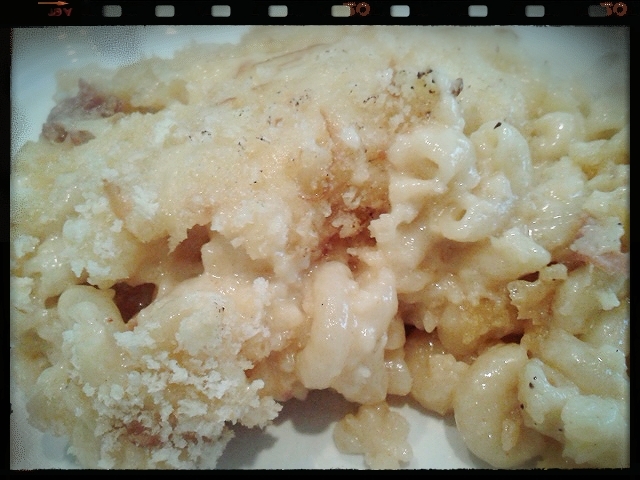 It was minus 30C during my most recent trip home, and that is most certainly mac ‘n cheese weather. Mac ‘n cheese has had a renaissance these past years, and with it a plethora of recipes have surfaced. I’ve tried a few of them – all delicious in their own right – and I think that I’ve come up with a nicely balanced one that has the right mix of gooey-ness, cheesiness, and saltiness. This is not what you ate on Sunday nights in your dorm room. That said, I will always have a special place in my heart for the fluorescent orange mystery powder and fossilized macaroni that mixed together so beautifully, and that tasted so good. If cooking is ever to be demystified, I guess the simple preparation of Kraft Dinner is as good a way as any. 1 handful of pancetta slices, chopped thin and short. Start by setting your oven to 375F. Then, boil the 2 cups of macaroni in well-salted water, until tender. Strain them, put them in a bowl, pour in a glug of olive oil, (just enough to coat the macaroni) and then mix around until the pasta is covered. This will keep them from sticking together. Set aside. Mix together the flour, salt, pepper, garlic powder, and smoked paprika in a bowl. Next, melt your butter in a frying pan at medium heat, cook your minced garlic for 20 seconds or so (making sure not to burn it), and then mix in the flour mixture until well combined (2-3 minutes). You’re looking for a thick paste, but not a dry one. This is like a kind of hoser roux. Add your milk and the pancetta slices to the mixture, and stir constantly until the sauce is thick and consistent (make sure to break up those clumps). This should take about 8-10 minutes. I would recommend you leave the sauce a little loose (i.e., not too thick)- you may need the extra moisture to ensure that the cheese melts properly, and you can always evaporate the extra liquid. At this point, still at medium heat, add your cheese 1/3 at a time, making sure that each batch melts down properly (though a few clumps of delicious cheese never hurt anyone). Carefully, give the mixture a taste, and adjust the seasoning if required. Pour the lake of cheesy goodness into your bowl of macaroni, add in 1 cup of panko, and mix everything together properly. Pour the whole combination into a casserole dish, cover everything with the remaining cup of panko, add a few sprinkles of paprika for colour, and bake for 25-30 minutes. Let it cool for at least 10-15 minutes because your mac ‘n cheese will be lava-hot. Also, letting it cool will allow the flavours develop (this tastes good reheated the next day, too). I recommend using a big spoon to ladle this bad boy onto your plate…and don’t be shy about seconds.